Miami STREET Law is an educational, legal outreach program that trains current law students to teach law at schools throughout Miami-Dade County. It is modeled after the clinic developed by Georgetown Law students in 1972 to teach high school students about practical aspects of the law and the legal system. Miami STREET Law was started in 2001 at Miami Law. Law students initially began teaching law at two schools: Miami Senior High and the Palmer Trinity School. Since then, the STREET Law Program has expanded to more schools across Miami-Dade County. Today, the Miami STREET Law Program teaches law, public policy and ethics to students in Miami-Dade County public and private schools. 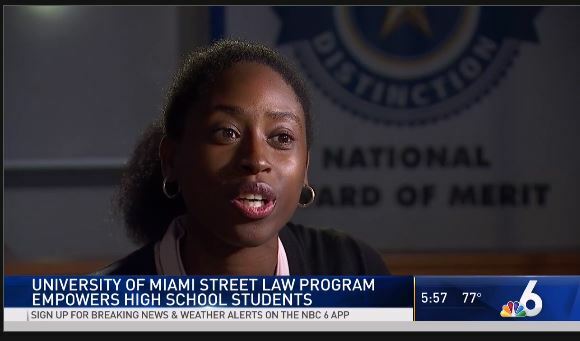 Students who participate in Miami STREET Law obtain course credit while they experience a unique, professional development opportunity. Through teaching about the law and interacting with the community, law students are given a chance to analyze state and local laws and procedures. Additionally, as STREET Law classes use interactive teaching strategies—including mock trials, moot courts and simulated negotiations—students can hone their communication and analytical skills while gaining exposure to other professionals and the community. STREET Law injects a human element into law school education, providing students with insight into public policy issues and concerns that impact their community. Miami STREET Law provides the South Florida community with essential legal information and helps high school students navigate through our law-saturated society. The Program serves to put lawyers in a positive light while at the same time creating positive role models for the students who participate in the classes. An ancillary long-term goal of the program is to increase diversity in the legal profession. In addition to the time dedicated to teaching, law students have a class that meets twice a week in which they study the STREET Law text, design their curricula for their schools, and practice teaching. STREET Law is a 2-credit class. The class requires weekly or biweekly teaching of law at a local high school, jail, juvenile justice facility or community center. Miami STREET Law participants teach a wide array of topics, including torts, criminal law, family law, constitutional law, court systems and landlord/tenant law. The law students in the program are known as "Street Lawyers." These Street Lawyers are paired in teams that consist of two interns, who are in their first year in the Program, and one fellow, who is in his/her second year of the Program. Each team is assigned to teach at a different affiliated school for a full academic year. Over 15,000 South Florida students have participated in the STREET Law program since 2001. STREET Law is currently conducted at more than 90 law schools across the country and in more than countries. Miami STREET Law — which is modeled after the national STREET Law Program — was started in 2001. Law students initially began teaching law at two schools: Miami Senior High and the Palmer Trinity School. Since then, the STREET Law Program has expanded to more schools across Miami-Dade County. For ideas on how to positively impact a teen's life through STREET LAW, listen to Nico Pelleya's ideas on pertinent topics and the challenges and rewards of being a Street Lawyer. Rob Weaver discusses the areas of the law which interest teens at Miami Senior High and the power of a Street Lawyer to be a positive role model. Hear Tamara Kosic's views on the rewards of being a Street Lawyer in two very different venues: in a correctional population of female convicted teenaged felons; and in a huge inner city school in Miami.